The passion that the members of Trinity Lutheran Church have for the study of God's Word is evident in the Sunday Morning Adult Bible Class. Each week, more than 100 adults gather for fellowship and Bible study between the 8:00 am and 10:30 am worship services. Bible Class begins at 9:30 am in the Parish Center of the School Campus. However, we encourage you to arrive early (anytime after 9:00 am) to enjoy a cup of coffee, a donut or pastry, and fellowship with the members of Trinity. Bible study topics vary, but the careful study of God's Word, as found in Holy Scripture, is always present. 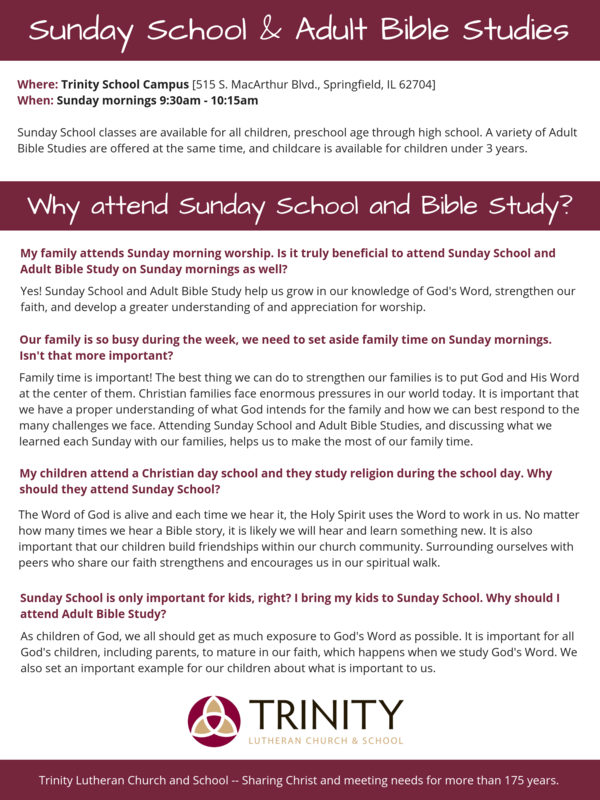 High school and college students are welcome and encouraged to participate in the Sunday Morning Adult Bible Class.